Let's take a look at Virginia baseball's all-time starting nine in this edition of the NCAA.com series of the best possible starting lineups for some of college baseball’s most successful programs. Here is how we picked the team: We dug deep in the record books, only considering the players' college career and accolades. Their achievements in professional baseball did not come into play. There was also consideration given to their positional fits and how well they fit into a batting order we made based on historical stats that could provide a combination of high batting averages, speed, and power. 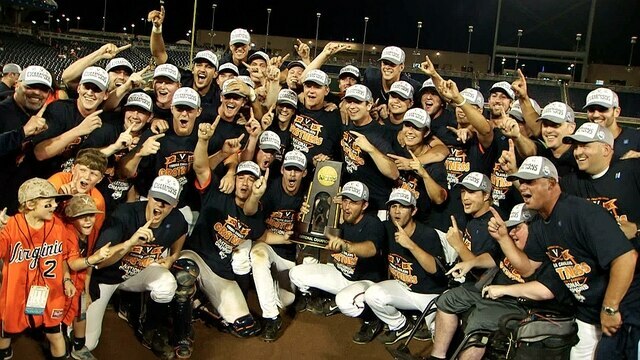 Virginia baseball is a bit different than other successful programs. Though the Cavaliers have been around for a while, their success is much more recent. But that success has been overwhelming, highlighted by back-to-back trips to the College World Series championship series capped by the 2015 national title. Despite most of the talent coming in the last decade, it was no easy task. Let’s take a look at the starting lineup. Why is Stone atop this lineup? He is the program's all-time leader in two categories we love to see in our leadoff hitter: steals and walks. Stone is tied for the most stolen bases all-time with 83 with season-highs of 26 and 21. His 156 walks are second to none by a large margin, the next closest being Sean Doolittle and Bill Narleski’s 125. Stone finished his career with a .324 batting average and 174 runs, so while this spot could have gone to a Brandon Guyer, the stats lean towards Stone. Narleski’s Virginia teams weren’t powerhouses by any means, but that didn’t stop the shortstop from becoming a Virginia legend. When you look in the record books, Narleski’s name is everywhere: he’s first all-time in hits (281), second in both batting average (.374) and runs (193), third in stolen bases (72), tied for fourth in RBI (166) and tied for sixth in home runs (28). Mark Reynolds and Mike Cubbage both received some worthy consideration, but the program’s all-time total base leader is a lock for the all-time lineup. Next to pitching, this was the hardest selection to make, one which we went back and forth on several times. You can go Ryan Zimmerman here and you would also be correct. Zimmerman finished his career with a .355 average, 250 hits, 128 runs, and 140 RBI. All impressive numbers, some still in the top 10 of Virginia lore. Add in an All-American season and back-to-back record-setting years in hits, and it seems wrong leaving him out of the lineup. Proscia ultimately gets the pick because the power numbers fit a little better in the heart of the lineup. He’s the program’s all-time leader in RBI with 182 and finished with 28 home runs (tied for sixth all-time) and 59 doubles (second all-time). His 254 hits are seventh all-time and he finished his career with a .322 batting average, so he wasn’t boom or bust. Proscia also earned 2011 ACC Tournament MVP honors, giving him a little extra boost. This is where it gets tricky. Virginia’s history is full of versatile players, capable of playing multiple positions. Some are listed as first basemen and outfielders, others as pitchers and first basemen, so with so many choices, and so little spots to fill, we’re just going to use the positions that fit best in this lineup. That puts Buchanan in the outfield. Buchanan slides into the cleanup spot because of his monster 1994 season when he set the program record with 22 home runs. In fact, he led the Hoos in hits, home runs, and RBI in both the 1993 and 1994 seasons. He finished his career with a nice .337 batting average as well in becoming the first Virginia player selected in the first round of the MLB Draft. Here’s where the position versatility comes into play. Doolittle was considered for pitcher but fell a little short. Though Jeff Booker and his program-best .376 average deserve recognition, there was simply no way we were leaving Doolittle out of the lineup. Three-time All-American. Check. A stud on the field and on the mound. Check. An on-base machine with power? Yup, go ahead and check that off as well. Doolittle was a rare talent, and he left the program as the all-time leader in wins (22) and RBI (167), and his 54-walk season was also second to none at the time. His 22 home runs were once amongst the top-10 and his 2.23 ERA and 243 strikeouts as a pitcher still are. Oh yeah, he was also the 2006 ACC Player of the Year if you needed one more reason as to why he’s a must have addition to the lineup. Brandon Guyer could have easily made the cut and was hard to omit, but Smith did plenty during his time in Charlottesville, including blasting a memorable two-run home run in Virginia’s clinching College World Series victory. While Smith’s numbers are good alone — his 28 home runs sixth in program history while his 178 RBI are second — it was how he played in the postseason that stands out. In three ACC tournaments, he went 14-for-35 (a .400 average) scoring 11 runs in the 2015 and 2016 tourneys alone. He drove in seven runs as a freshman in the NCAA tournament and had a five-RBI game in the 2017 tournament. But perhaps the most impressive number Smith posted was in 2017 when he had more home runs (13) than strikeouts (12). This was a tough one. Before Kevin O’Sullivan was leading Florida to the College World Series as a skipper, he got his start behind the plate with Virginia. He was good, too, finishing with a .351 batting average (sixth all-time) and back-to-back First-Team All-ACC selections in 1990 and 1991. Virginia Athletics Kevin O'Sullivan got his start behind the plate for Virginia. Gosselin was part of Virginia’s first College World Series team and simply did everything well. His 2010 season was a monster one, establishing the single-season record with 100 hits to go along with a .382 average, 11 home runs, and 22 doubles. His career stat line says all you need to know why he is in this lineup: .337 batting average, 19 home runs, 142 runs, 145 RBI, 222 hits and 48 stolen bases. That’s just consistency. We've never added a utility player to these lineups before, but Koshansky is a Virginia Hall of Famer and needed some attention. Koshansky was solid with the bat and on the bump, but there were two reasons we couldn't leave him off this team. The first is because he was a first himself, taking home Virginia baseball's first-ever ACC player of the year award. The second reason is just a cool stat: in 2003, Koshansky led the Cavaliers in wins (7) and home runs (9). Picking a Virginia pitcher is no easy task. Since 2004, the Cavaliers have had 30 pitchers earn All-ACC honors, the most in a conference loaded with talent on an annual basis. Casey Lambert is our closer if we had one, not simply Virginia's best closer of all-time, but arguably the ACC's and one of the best to ever do it in all of DI, with his 43 saves sixth-most in history. Tim Burcham would earn a rotation spot simply because he's the first All-American in program history. And Seth Greisinger is about as solid a Saturday starter as you'll find. That doesn't even mention a guy like Tyler Wilson, and that shows how deep this all-time arsenal really is. Hultzen gets the nod to lead us into the weekend. Let's start with the accolades, shall we? He was the 2009 ACC freshman of the year and followed that up with both the 2010 and 2011 ACC pitcher of the year awards. In his monster 2011 season, he was a Golden Spikes finalist and the John Olerud winner. Now, how about those numbers? Hultzen was good with the stick, but his bread and butter was on the mound. His 12 wins in 2011 were the Virginia single-season record and his 32 career wins are also the best in school history. His 2.08 ERA is third-lowest in school history and his 395 strikeouts are the most, with his 165 in 2011 being UVA's best single-season mark ever. Duh. Where do you begin? O'Connor led Virginia to the NCAA tournament 14 years in a row between 2004 and 2017. He won two ACC titles with four 50-win seasons over that span. Throw in three national coach of the year awards, four trips to Omaha, and that shiny 2015 trophy and you're looking at one of college baseball's greatest all-time runs. O'Connor is as no-brainer a pick as it comes.